I really don’t love that we have to fly out at 5:50am. At least on the bright side, we’ll arrive in New Orleans earlier than planned, which means more time to explore. And you know, eat. First stop, beignets, of course. Did I tell you that I booked our Airbnb based on walking distance to Cafe du Monde? My food obsession knows no end. lol. I thought we left the rain, but I guess not. Lol. Because it’s raining in SF and New Orleans. 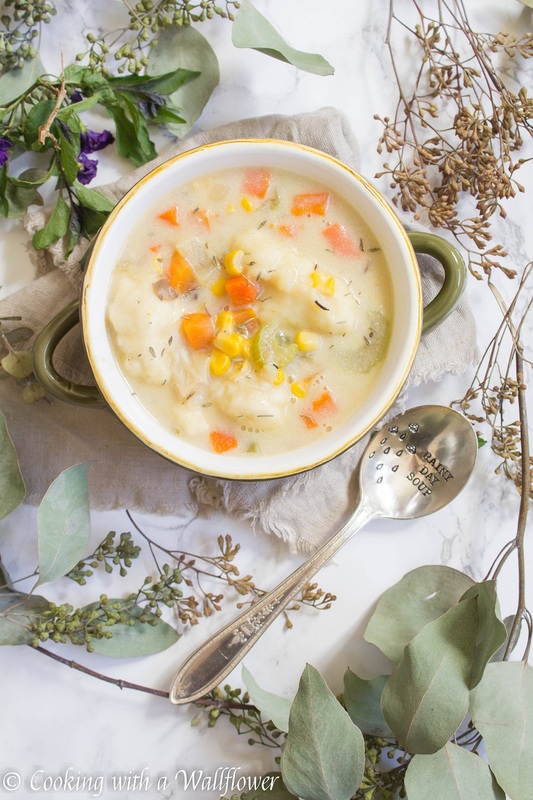 But that’s okay because for all of us who are dealing with the rain, that means it’s still soup season. And I absolutely love soup season. 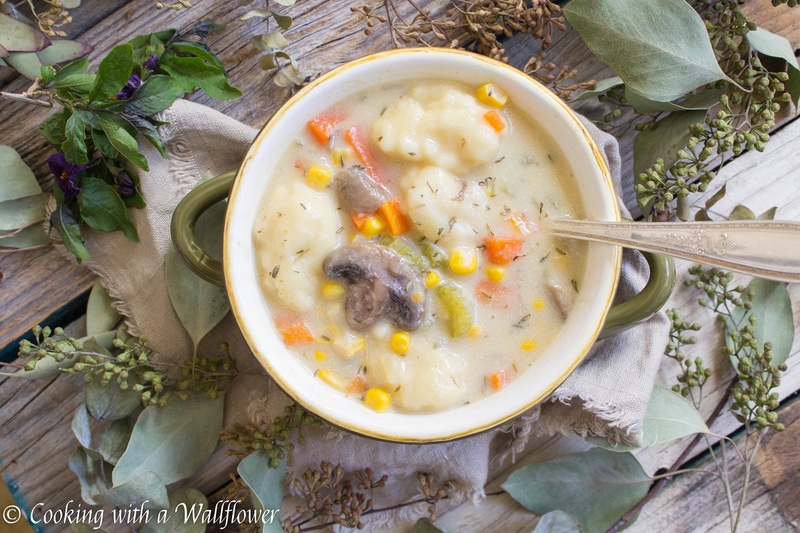 So if you’re looking for something warm and comforting to get you through cold rainy days. 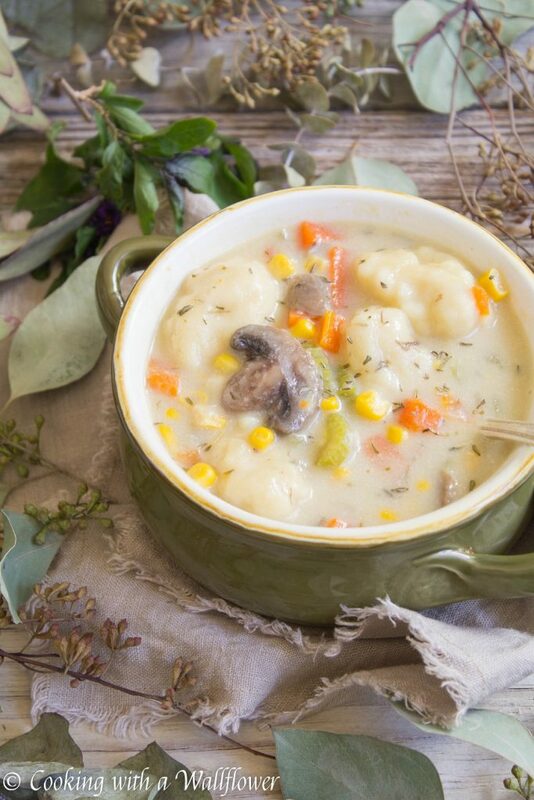 This creamy vegetable and dumpling soup is definitely what you need to try. 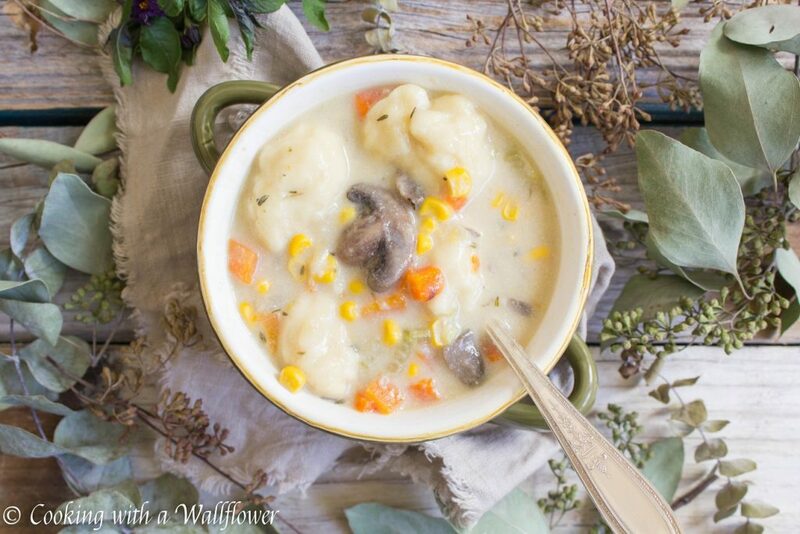 Filled with vegetables and buttermilk dumpling, it’s creamy and oh so satisfying. 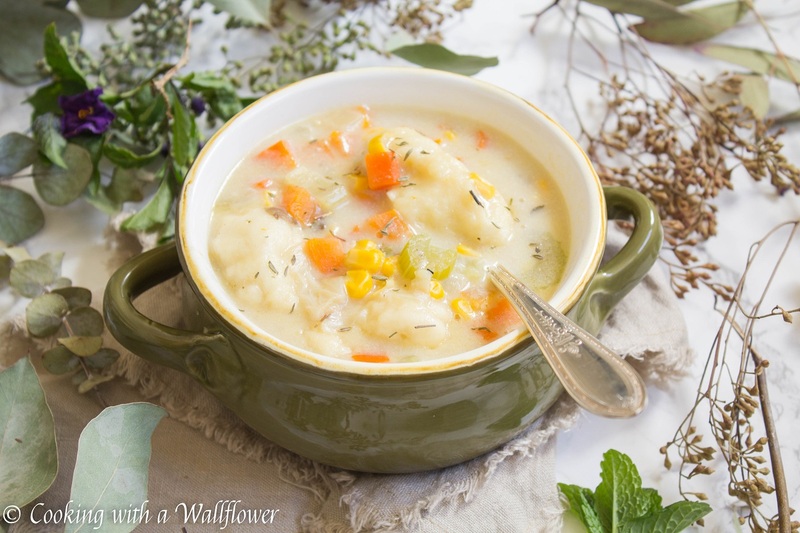 Simple ingredients, easy to follow instructions, delicious comforting soup. I can eat this for daaaays. Don’t you just love that sometimes you don’t need much to turn something so simple into something so much more? 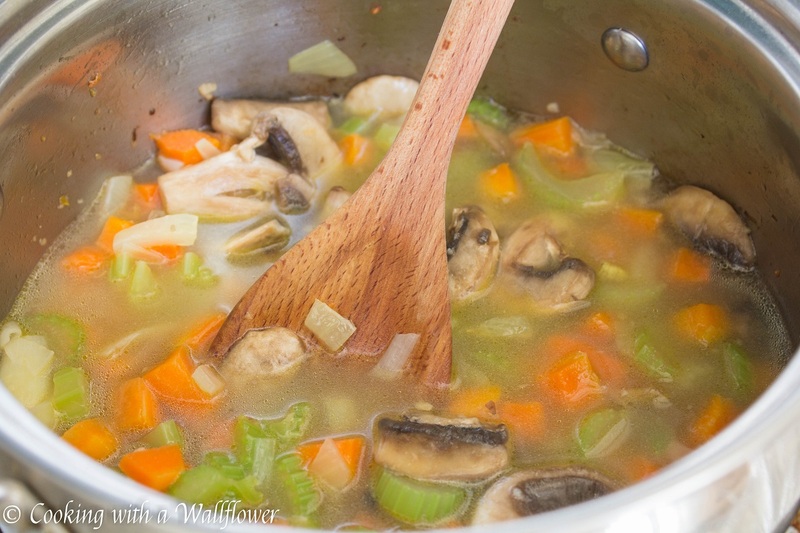 The carrots, celery, and onions add depths of flavor to the soup. 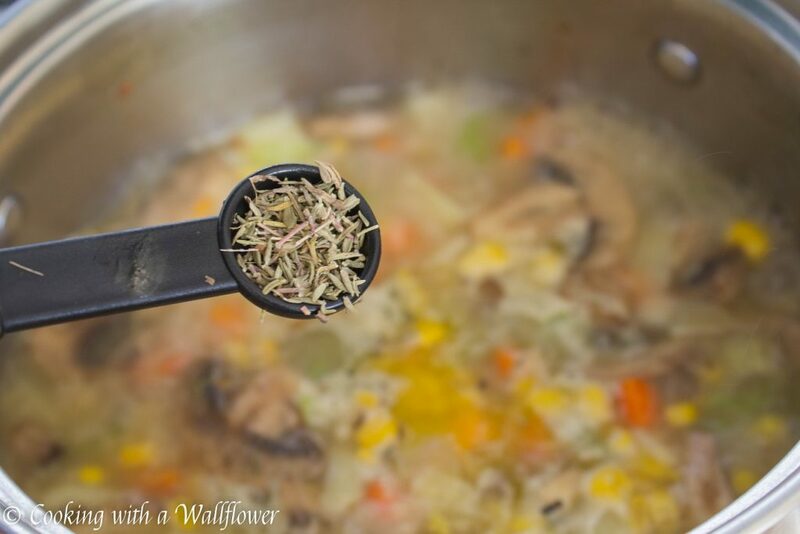 Only dried thyme, or fresh thyme, if you are lucky to have it on hand, and salt are added to season the soup. And even though these are the ingredients that I used for my soup, it doesn’t mean that you can’t add other veggies or other seasoning to take your soup to the next level. In a large pot, add olive oil over low to medium heat. 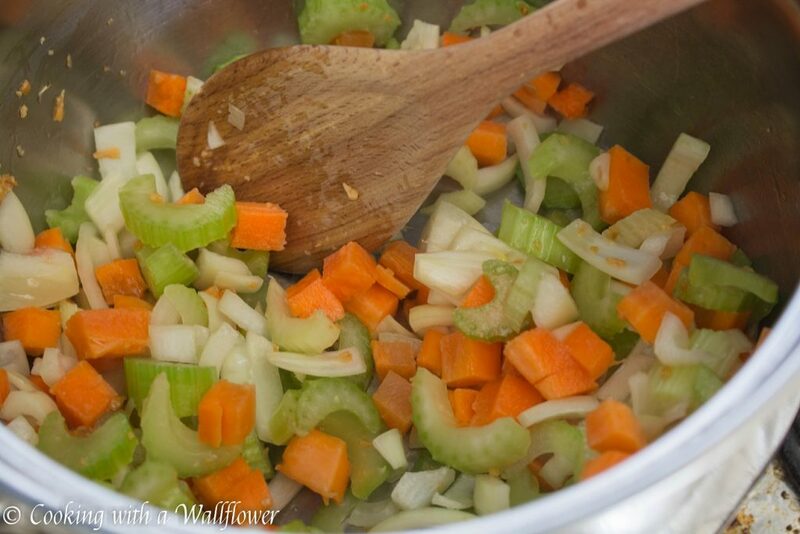 Once the olive oil has warmed, add onions, celery, carrots, and garlic. Cook until they’ve softened and are aromatic. 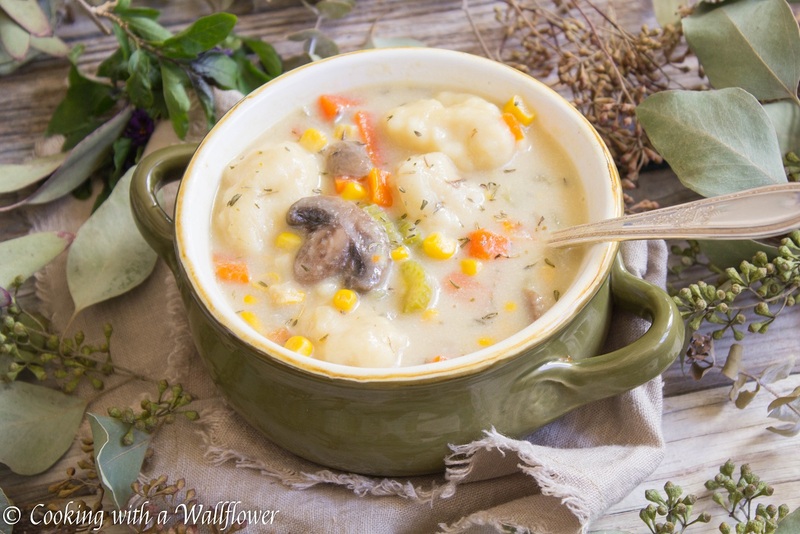 Add corn and mushrooms, and cook until softened. In a small bowl, add flour and a little bit of the milk. Whisk until the flour has dissolved. 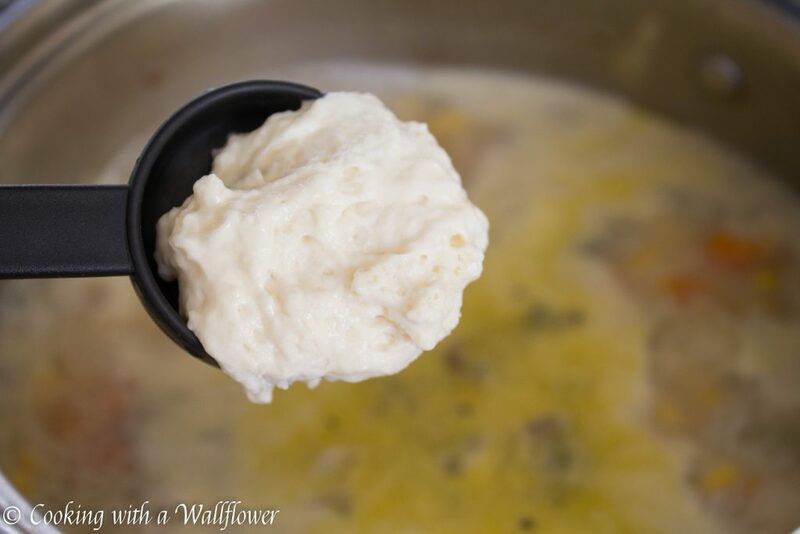 Slowly pour this flour mixture into the soup and stir to prevent clumping. 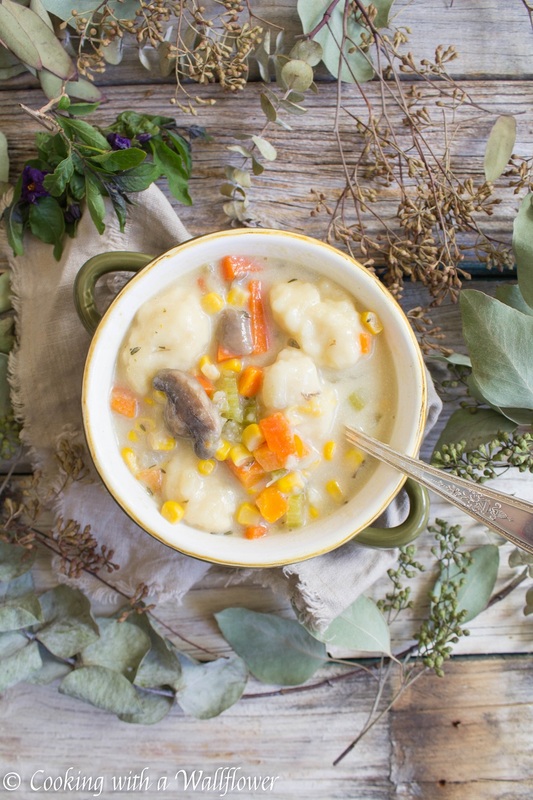 The flour will help thicken the soup. Pour the rest of the milk into the soup. 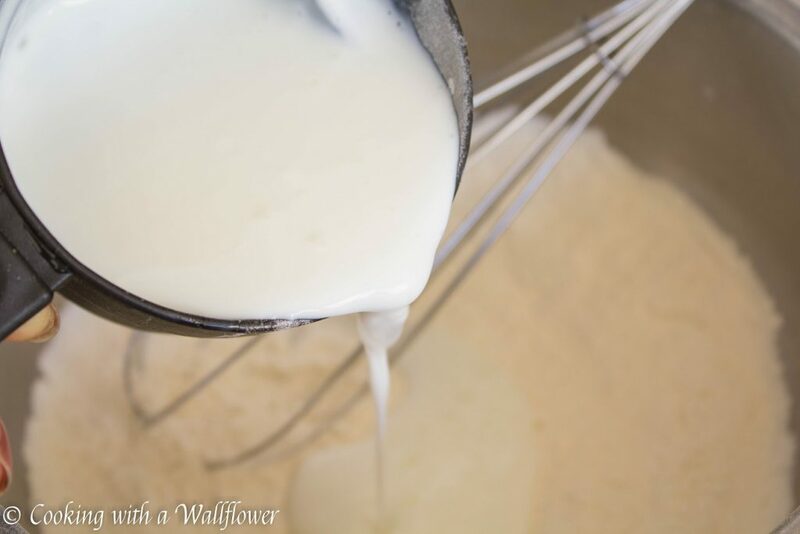 In a medium sized bowl, whisk together flour, baking soda, and salt. Add the buttermilk and mix until combined. 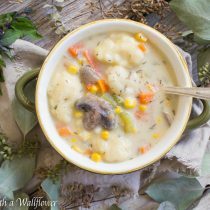 Scoop a tablespoon full of the dough and gently drop into the part of the soup that is bubbling. Continue until all the dough is used, about 8-10 dumplings. Allow the dumplings to cook for 2-3 minutes until cooked through. 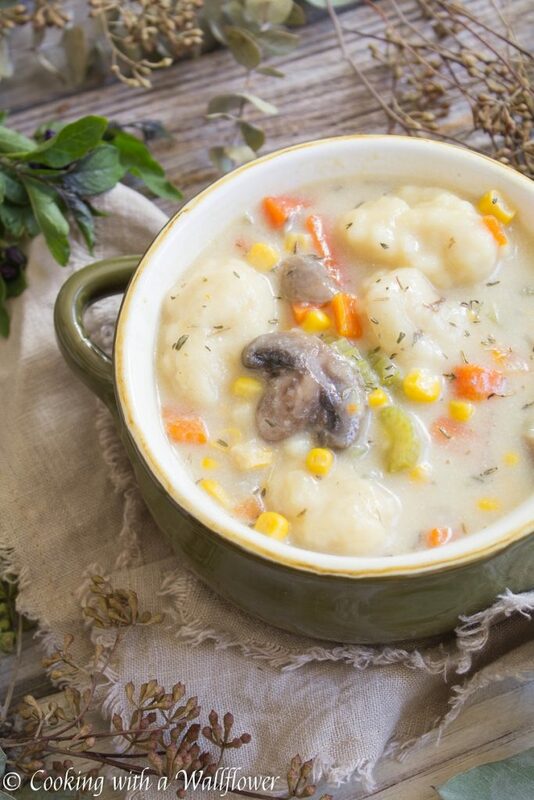 Serve this creamy vegetable and dumpling soup warm. Lovely pics and very well explained. Like the print button idea. Wow the soup looks delicious! Yum! Definitely want to try making this.